"Can brew regular coffee or specialty brews." "Has a removable filter basket that makes using your own grounds simple." "A convenient way to brew coffee, tea, and concentrated coffee shots." "Reviewers praise the sleek look, ease of use, and simple cleanup." "It doesn’t require electricity so you can take it anywhere." "Users praised the flavor of the coffee produced by this all-in-one machine." "Can brew from 4 to 12 ounces of coffee at a time." "Brews directly into the included travel mug so you can take coffee on-the-go." Why limit yourself? This single-serve coffee maker can fill your travel mug with regular coffee as you’re dashing out the door on a workday, but it will also make specialty brews, froth your milk, and let you choose your own cup size with a simple dial. Choose from classic coffee, super-rich, or brew for serving over ice. Since this doesn’t use pods, you can buy your favorite coffee beans from a boutique local coffee roaster or buy inexpensive grocery store grounds to save money while still making interesting coffee drinks every day of the week. Special thermal extraction ensures full flavor no matter what you brew. This has a removable filter basket that makes coffee brewing simple from your own grounds. No expensive pods and no need to fill tiny filters, so there’s less expense and less mess. This brews up to 16 ounces of coffee to fill the included insulated travel mug so you can hit the road. If you prefer savoring a cup at home, just use your favorite mug or cup. The small size makes this great for tiny spaces, whether you have a small kitchen or you want to bring this along on your RV travels. The mug serves double duty since it can be used with the Oster My Blend if you happen to own one. Additional mugs are available for purchase. This coffee maker and matching mug come in a variety of colors. There’s no doubt about it, brewing coffee with pods is convenient, and there are more and more types of coffee available every day, along with tea and other beverages. But this coffee maker is more than just convenient. 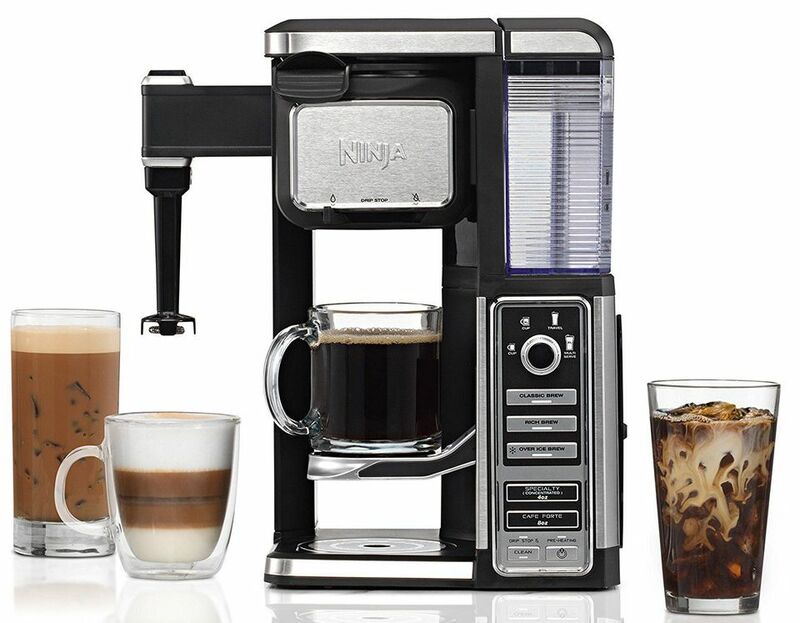 It can also brew concentrated coffee shots with the push of a button, so you can create coffeehouse style drinks at home, or choose to brew a stronger cup of coffee whenever you want it. The frother cup gives you hands-free frothing of milk, skim milk, soy milk, or almond milk, and the cup is dishwasher safe for easy cleaning when you’re done. You can choose from four different cup sizes from 4 to 12 ounces. The 60-ounce water reservoir lets you brew multiple cups of coffee before you have to refill, saving you time in the morning. This also saves energy by turning itself off two hours after your last cup of coffee was brewed. The sleek look, ease of use, simple cleanup, and flavorful coffee were praised by reviewers of this coffee maker. It can accommodate either standard coffee cups or travel mugs up to 14 ounces and 7 1/4 inches high and has a bold setting for extra-strong coffee. This has a permanent metal mesh filter, so a paper filter isn’t required, but some users prefer the flavor of coffee that has been filtered more thoroughly. This can accommodate some small paper filters made by other brands, while some users said that cutting large filters to size is easy and affordable. It doesn’t get more compact than this—you can even take it with you when you go camping since it doesn’t require electricity. All you need is hot water and ground coffee. For extra convenience at home, you can heat the coffee right in the water reservoir in your microwave. This can use either k-cups or your own ground coffee. Once you’ve got water and coffee, you simply pump the water through the grounds and into your favorite coffee mug. The silicone grip makes this easy to hold, even when it’s full of hot water. This can make from 6-10 ounces of coffee, and it’s simple to toss the grounds, rinse the base, and brew more whenever you want it. While this is built to be portable and compact, users were pleased with the flavor of the coffee. This can also be used to brew hot tea, simply by placing a tea bag in the space where the coffee would normally go. Although this is built for travel, users praised the flavor of the coffee produced by this all-in-one grinder and brewer. The beans couldn’t be fresher since you grind directly into the filter right before you brew. Grinding is a manual process but doesn’t take long since you’re grinding a small amount and the crank is simple to operate. Unlike an electric grinder, you won’t produce excess heat that can damage the flavor of the beans, and you can choose a fine or coarse grind, depending on how you like your coffee. This holds one cup of water for brewing, but it does not heat the water, so you’ll need to do that separately. Whether your office is above the garage at home or you’ve got the corner office with a view, this coffee maker will be a great fit. This can brew from 4 to 12 ounces of coffee at a time, while the strong brew button increases the strength of the brew for a bolder cup. You won’t need to wait long since this brews a cup of coffee in less than a minute. If you’ve got a cup of ice, you can use the iced brew setting to make iced coffee any time you like, and the 75-ounce water reservoir means you won’t have to make a lot of trips to fetch water for your brews. When you need to fill it, the reservoir is removable. The hot water on demand button dispenses hot water for your instant oatmeal, or cup of soup or noodles for those days when you’ll be eating at your desk. It’s also handy for making tea using your favorite tea bags rather than k-cups. Perfect for a groggy morning in the dorm and for late-night studying sessions, this brews directly into the included travel mug so you can take coffee on-the-go and keep it handy with a lid on to thwart spilling. The mug is insulated to keep the heat off your hands and to keep the coffee warm as you dash across campus or sit in the morning class. If you lose the mug, other standard travel mugs will also work. This has a permanent filter, so there’s no need to spend money on paper filters, and it uses your own ground coffee so you save money. For ease of cleaning, all the removable parts are dishwasher safe, and just as easy to hand wash. The brewer turns off automatically after it finishes brewing, saving power and extending the life of the brewer. The small size makes this perfect for tiny dorm rooms, and it would also be at home in an RV or a small home kitchen where counter space is at a premium. Our writers spent 2 hours researching the most popular single serve coffee makers on the market. Before making their final recommendations, they considered 14 different coffee makers overall, screened options from 12 different brands and manufacturers, read over 10 user reviews (both positive and negative) and tested 2 of the coffee makers themselves. All of this research adds up to recommendations you can trust.